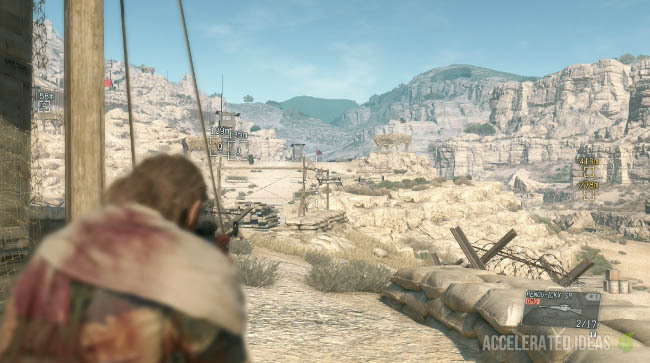 Ok, this is where The Phantom Pain starts to get tricky and it isn't because the mission is difficult, it's because free roam interferes. In this walkthrough I'm going to help you find the Russian Defector in "Over the Fence" Mission 5, including the criteria required to make him spawn and avoid wasting your time. Before I start, a little info on the mission itself. Over the Fence is Mission 5 in the main mission list. 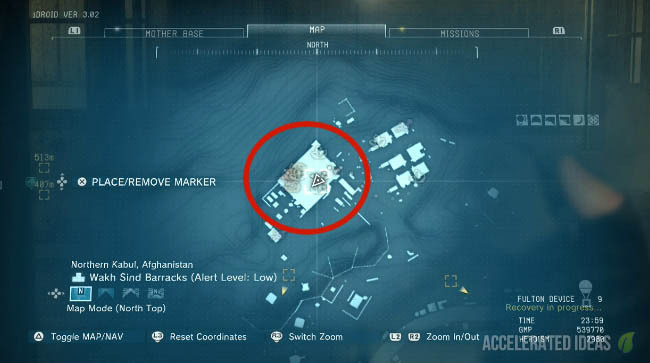 Players must rescue (Fulton) a Russian Defector who is being held captive at Wakh Sind Barracks, centrally west of the Afghanistan map. 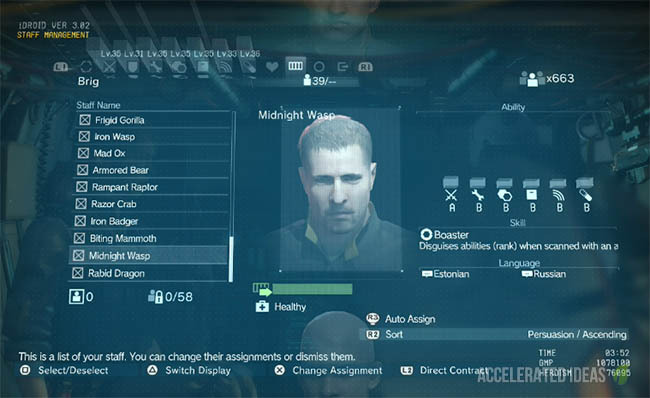 The reward for this mission is a nice 100,000 GMP in addition to new engineer skills for Mother Base (via the new recruit). To find the defector you need to work your way to the north of the base and get inside the large building (shown on the map above). 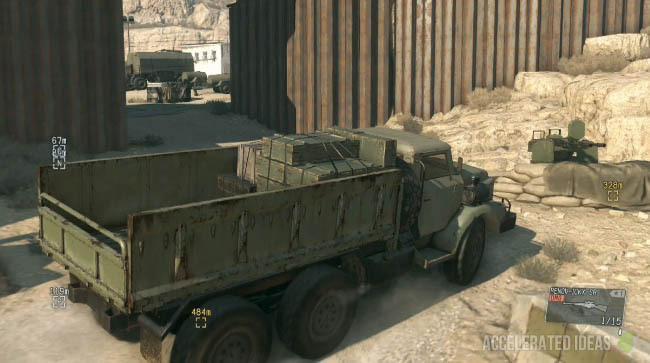 To do this, approach the base from the west and take out the small guard post on the edge of the barracks, claim the resources, cassette tapes and any rough diamonds. Then work your way up the hill (via the road) to the main entrance to the camp. There are high walls so you'll need to either use the main entrance or work round from the sides. Once you've taken care of the enemy inside, move towards the large building and go through the eastern entrance leading underground. There will be more soldiers inside this area so take your time here. As you approach the underground section, look to your left to spot the first prisoner cell. There is a matress on the floor and a pile of rubble in the corner. Walk inside the cell and then pick the lock on the red door to gain access to the interrogation room where the Russian Defector is located. The cell has a single desk chair inside and a broken wooden crate on the floor. This room may be empty - if so then read the information below to make the defector spawn correctly. Why won't the defector appear?? It turns out that MGS V has a very strict Free Roam option that is perfectly fine for Side Ops but less intuitive when it comes to main missions. 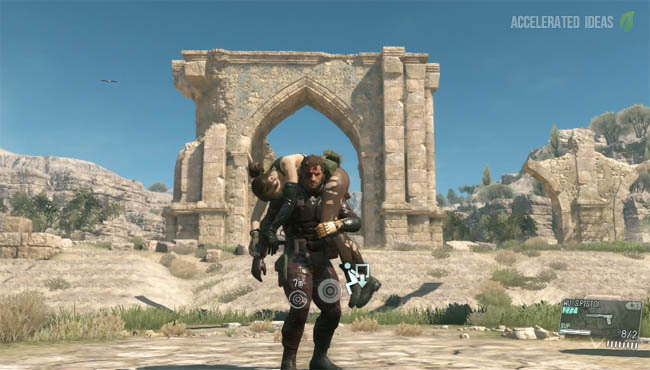 Unlike the Witcher 3 where players can pick up quests and complete them at their leisure, in the Phantom Pain you have to initiate a main mission. That doesn't just mean selecting it from the menu either, you have to trigger the mission to start and thus spawn in the necessary targets etc.. The way to solve this problem is to trigger the mission to start. This can only be done by selecting the mission from the iDroid and then taking note of the Mission Start markers on the map. These are the yellow squares that usually appear around the edges of the mission area, and are the landing zones should you arrive by helicopter. If you're in Free Roam, then you have to physically visit these marker locations and interact with the care package on the floor. Only then will the cutscene play and the mission will spawn correctly. There are two Mission Start points for the Over the Fence mission, so visit one of these and interact with the care package to start the mission. Interestingly, when the mission starts the resources and diamonds do not respawn but the enemies do. Now go back to the exact location of the Russian Defectors cell, Fulton him and complete this mission once and for all! Lesson learnt.